I am the oldest of 2 daughters and I’ve never been any good at sharing my food. When people even politely ask for a bite I protectively lean over my plate, guarding it for dear life. Take for example, all the times my godly mother took a pumpkin pie to the neighbors house. Sure, we still had two at our house, but I’d be damned if Mrs. Skaggs was going to get the third. I had a 3 pie system and with extra whipped cream please. On the sweeter side, baking with my mom was an important part of my childhood. It is still something that I enjoy and I have even gotten better at sharing with friends or as a means to bribe my co-workers. My love of baking has started to spill into all areas of my tiny studio apartment and I've started collecting vintage cookbooks. Most of them from the 1950's and 60's. I think I’ve even found myself from a past life within the pages. 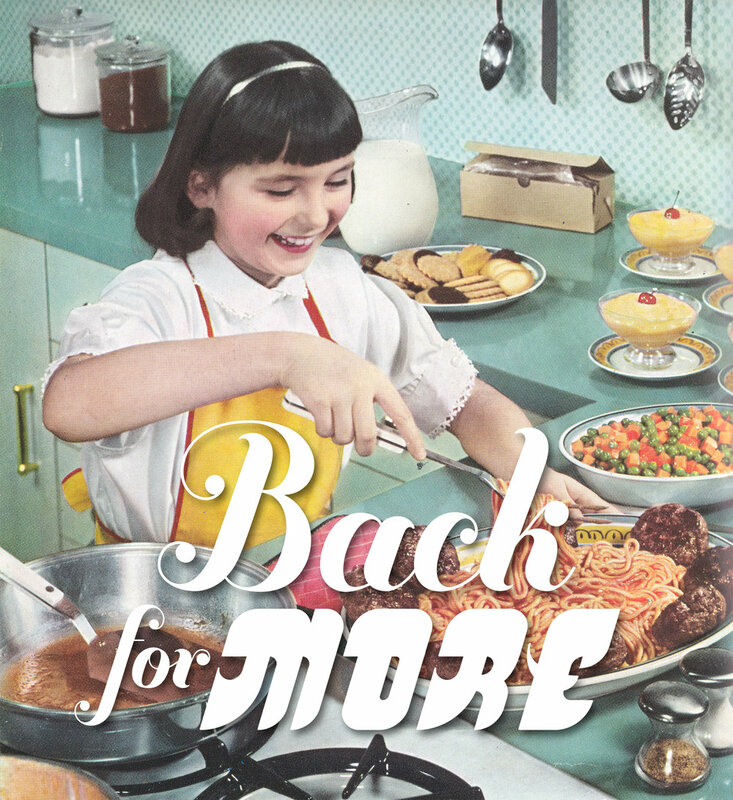 The 1959 edition of, The General Foods Kitchens Cookbook features beautiful high key photographs of hams, picnics and all types of delicious treats with meticulously staged settings for ambiance but this girl helping herself to the biggest plate of spaghetti won my heart. She seems to be saying, “I live my life to the fullest”—quite literally. The book also features some of the most adorably quaint illustrations by Mary Ronin that would fit in seamlessly, framed on the walls, of the new artisan boutiques that are currently popping up. These boutiques seem to be thriving with a resurgence of handcrafted goods, giving homage to the 19th century Arts & Craft Movement. This growing interest in hand-craft is closely aligned with a turn towards a nostalgic lifestyle. In a time when the world seems like a very overwhelming place it feels good to embrace the comfort and traditions of past generations; I often turn to my mom and her 6 sisters for baking advice. While this desire for nostalgia can seem like escapism and clearly does not hold all of the answers, I personally am comforted when I’m in my kitchen baking a family recipe with my classic cherry red Kitchen Aid mixer. You only live once, pick something you love and keep coming back for more! Over the next few weeks I’ll be documenting the design process of my brand redesign and highlighting the objects and food that surround me on a daily basis.